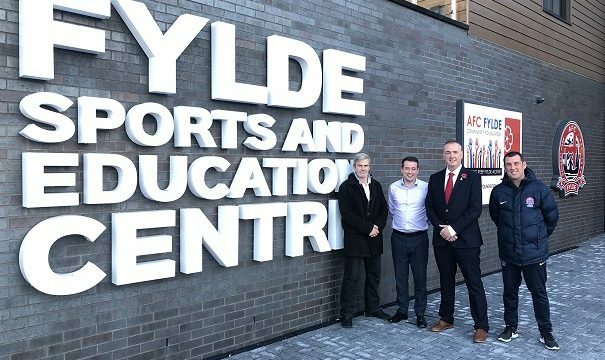 Lancashire Police and Crime Commissioner has awarded AFC Fylde Community Foundation over £18,000 which will play a vital role in helping reduce reoffending within Lancashire. With the help of the Police and Crime Commissioners funding the Foundation has been able to develop an innovative new project enabling offenders in custody to prepare for their release. The programme named ‘Positive Pathways, Connecting Communities’ involves Foundation staff meeting with offenders whilst they are still in custody to help build an action plan on what they may need additional support with when they are released. Recently the Foundation welcomed Lancashire Police and Crime Commissioner Clive Grunshaw to join them at HMP Preston and then on to the Fylde Sports and Education Centre to discuss with the governors the success of the Foundation’s rehabilitation programme centre and the ongoing plans for the future moving forward. Later on in the day Foundation staff then introduced Clive to a real ‘Positive Pathways, Connecting Communities’ success story Jason, after making some wrong choices in life Jason is now on a positive path and being mentored closely throughout his journey on the programme to set him up for the years ahead. Jason, who has worked with the Foundation for the past three months has been through an incredible journey. Jason has been working with AFC Fylde since his release from prison. Jason has a background of committing crime and has been in and out of prison for over 25 years. Jason stated that sometimes he has committed crime too deliberately get caught and placed back into custody as he feels safe in prison as he gets fed and doesn’t have to look over his shoulder, with a background of drug and alcohol abuse he has worked with previous partners to improve his life but has never felt motivated enough to engage in support. With the help of the ‘Positive Pathways, Connecting Communities’ project AFC Fylde staff met Jason while he was in custody and were able to plan what he needed upon his release. This included helping maintain accommodation and support for his alcohol and drug issues. Since his release from prison, his engagement has been brilliant and Jason is happy in his accommodation making friends and finding positive ways to fill his time there has been a change in the way Jason tackles life and his personality is one of a glass half full than a glass half empty. “It was great to hear how the ‘Positive Pathways, Connecting Communities’ programme is making a real difference across the county. It was really informative to meet Jason who has experienced first hand the support that the programme offers. “Policing alone cannot prevent people reoffending and this builds on the work already being done across the county. It is clear that programmes like Through The Gate and others I have funded can make a huge difference and help turn people’s lives around. For more information and news stories please visit www.afcfyldefoundation.co.uk or keep up to date with all of our updates on twitter @afcfct.